4Easysoft PDF to Word Converter is a standalone program, which can help you convert PDF to doc or rtf Word formats without Adobe Acrobat Reader or Microsoft Word installed! This PDF to Word Converter also supports multi-languages: English, Turkish, Thai, Latin, Korean, Greek, Cyrillic, Arabic, Japanese and Chinese. Besides, 4Easysoft PDF to Word Converter has simple settings and intuitive interface to make it easy to use, adding to fast conversion speed and the function that supports converting many PDF files at one time, so you can just easily edit your PDF files to Word format. 4Easysoft PDF to Word Converter allows you to convert PDF file to doc or rtf Word formats so as to enable you to smoothly edit it. 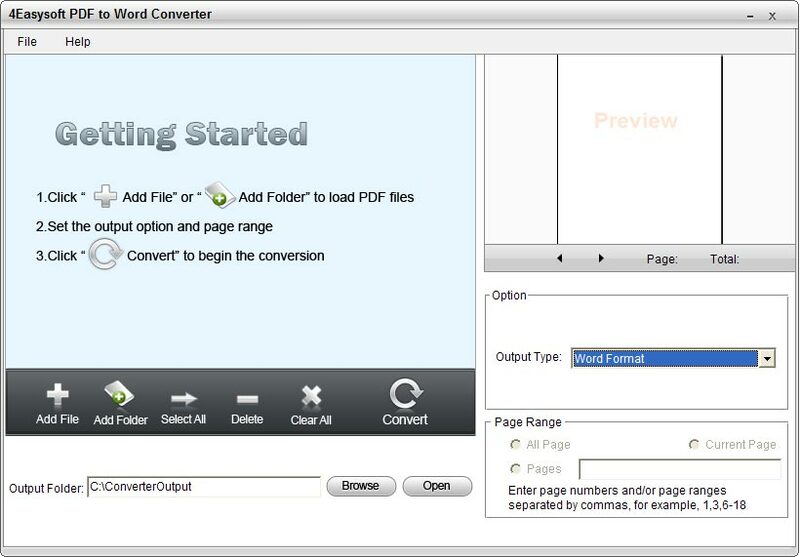 This PDF to Word Converter can also help you convert more than one file at a time. With this PDF to Word Converter, you can select to convert all the pages, or partial pages of PDF file to Word file. The user-friendly interface and fast processing speed can make the PDF to Word converting in a very short time. 4Easysoft PDF to Word Converter has powerful language-supporting functions, including English, Turkish, Thai, Latin, Korean, Greek, Cyrillic, Arabic, Japanese, and Chinese.